shadamy comic . dont say wtf if u dont like it. Wallpaper and background images in the Sonic the Hedgehog club tagged: shadow amy sega. Silvaria is veri funny but dose two yould be togeder. DEVIANT ART ROCKS!!! i WORSHIP it! it frikin awesome oh yeah if u LUV da shadster (shadow the hedgehog) then go 2 search box & type in exactly: OMG SHADOW IS SO AWESOME and put it in caps lock! oh and click on the first 1 & also when u come to the very first 'blocked out' thingy piture yknow the 1 w/ the gray minus on it DONT clik on it cuz it has shadow bein KILLED by like a fancharacter er somthin' its NOT funny, man! im seriously not kidding! THATS NOT TRURE I DID NOT OBEY U FREAK I LOVE SONAMY HEHEHEHEHE................................­...­...­...­...­...­...­...­...­...­...­...­...­...­...­...­...­...­...­...­. I mean SEREOUSLY! 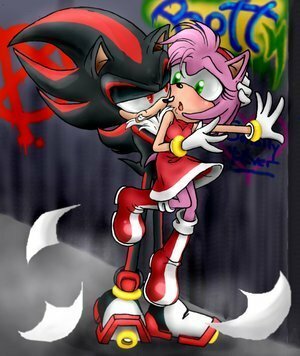 Amy thinks Shadow is Sonic!!! She is retarted!